Take off the “feel good” Alt-Media glasses and face the facts, sanctions are very successful in inflicting Hybrid War harm against victimized states, which is an “inconvenient reality” that Iran’s being reminded of right now. Contrary to the “politically correct” Alt-Media dogma that sanctions “only make states stronger”, some of them are inevitably destabilized by this asymmetrical weapon whenever it takes on Hybrid War dimensions, as it currently is in Iran. The Islamic Republic is being besieged from within due to the external encouragement of the time-tested tool of speculation as a means for influencing the country’s financial and currency markets, with the result being that economically driven protests are spreading throughout the country’s capital and into other cities as well. These aren’t the first such mass demonstrations this year because Iran earlier had to deal with large-scale protests over similar issues roughly six months ago, which were also sparked by civil society’s discontent and ended up being guided by largely unseen foreign hands in the direction of destabilization, too. The same phenomenon is repeating itself once again, albeit possibly with the intent of transforming the previous “test run” into the “real thing”, or in other words, seeing foreign state actors (mostly the US & Saudi Arabia) providing clandestine military support to urban and rural terrorist/”insurgent” forces in order to provoke a self-sustaining cycle of escalation that could be manipulated for geopolitical ends. Last winter’s unrest could in hindsight be seen as a probe for gauging the government’s response and testing the limits of what could “acceptably” be done before eliciting a reaction from the security forces. Armed with this contextual Color Revolution knowledge, they then proceeded to experiment with their modified techniques in Iranian Kurdistan, which has a militant history of preexisting identity discord and is therefore the most susceptible part of the country to Hybrid War. The authorities cracked down on smuggling in this region in early spring, but this had the effect of prompting protests by the impoverished locals who complained that they couldn’t receive much-needed supplies at the prices that they had previously depended on. Moreover, the Kurdish population was already predisposed to more political assertiveness following the nationalist demonstration effect that they observed in neighboring Iraqi Kurdistan last fall after the region’s unsuccessful independence attempt. The cocktail of nationalist and economic concerns created fertile ground for demagogues to argue that the entire population should take to the street in order to resist the government’s anti-smuggling crackdown. Although disconnected from the current events in Tehran, the Mainstream Media narrative will predictably be that this new round of protests originated in Iranian Kurdistan and have since spread nationwide. The present events are driven more by speculation (whether unfounded or not) than anything else because many people are worried that Trump’s unilateral withdrawal from the 2015 nuclear deal, the reimposition of sanctions, and subsequent November deadline for the world to stop purchasing Iranian oil will totally wreck their economy and lead to a sharp decrease in living standards. After all, the US’ “zero tolerance” policy of refusing to issue any “secondary sanctions” waivers to China and India – Iran’s two largest energy partners – might lead to them curtailing their oil imports in order to avert a more pronounced trade war with America. Should this happen, then the US would succeed in Asia against Iran where it failed in Europe against Russia by significantly dipping into its opponent’s market share and therefore depriving it of much-needed cash revenue. Making matters even more pronounced is that many Iranians, and particularly those in the urban areas such as Tehran, genuinely believed in the false hopes that the “reformist”-led Rouhani government encouraged in their hearts after the 2015 deal that convinced them that their personal futures would be brighter than ever before. Whether this was a deception all along or just a terrible and mismanaged policy to begin with, the fact of the matter is that many people feel deeply disappointed by what happened and might be less willing to passively accept a worsening of their living conditions no matter how much the government says that Trump is solely responsible for this. The knock-off effect of this speculation is that the value of the Iranian rial has plunged and everything is now naturally more expensive for everybody. 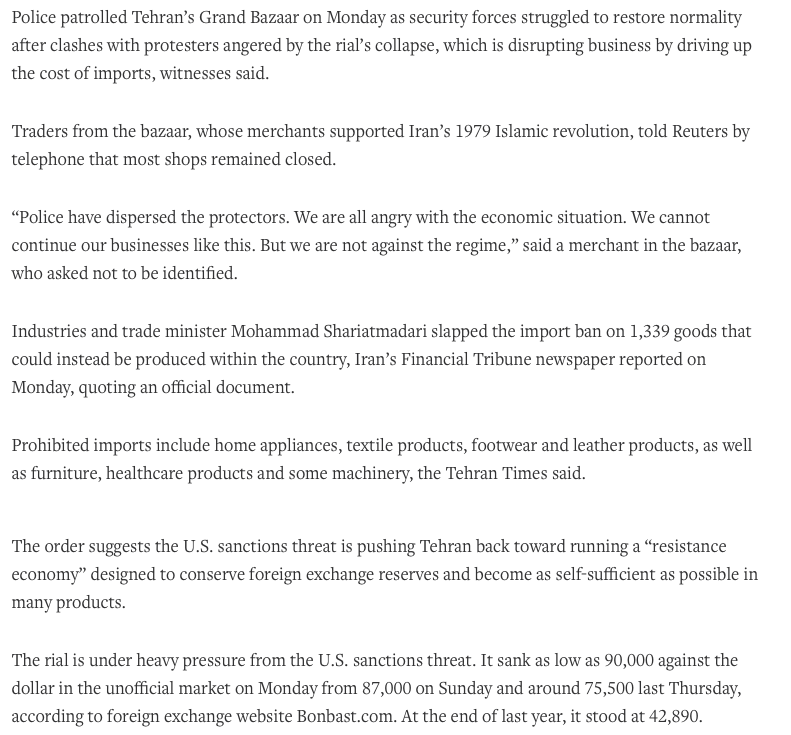 In response, the authorities banned the import of 1300 products in a bid to boost Iran’s “resistance economy” of “Make in Iran” import-substitution, though it may take an undetermined length of time for this policy to reap actual results in placating the anxious and protesting masses. In the meantime, a “window of opportunity” has opened up for external forces to exacerbate the economically driven internal unrest in an attempt to steer it towards a geopolitical direction. The government is well aware of this scheme and that’s why the Ayatollah decreed that “economic security” must be safeguarded at all costs in order to prevent this manufactured crisis’ exacerbation and the US’ resultant artificial recreation of the same series of events that led to the 1979 Islamic Revolution. The Shah’s primary weakness wasn’t so much that he was an authoritarian ruler, but that he failed to improve the economy to the point where the majority of the population wouldn’t care about political issues because everything was comfortably taken care of for them. Economic protests eventually spiraled out of control after the state resorted to using its monopoly on violence against peaceful demonstrators, therefore triggering a self-sustaining escalation cycle that never abated no matter how hard the government tried. This quickly led to the Shah’s overthrow, which was soon thereafter taken advantage of by the Ayatollah in order to usher in an Islamic Republic on the backs of the many leftist protesters who made the revolution happen in the first place. Adapting this model to the present day, the US is hoping that the state security forces either overreact to the economic protests (some degree of which are being directly and indirectly influenced from abroad) or are pressed into do so by the most unruly rioters’ provocations, which could then set into motion the “revolutionary” Hybrid War cycle that could see the Islamo-Marxist MEK terrorists becoming the vanguard force for destabilizing the Iranian state at the behest of its US and Saudi patrons. Accordingly, this could spark the series of cascading scenarios elaborated on by the author in his July 2016 analytical forecast about “The US-Saudi Plan To Prompt An Iranian Pullback From Syria” that include the foreign empowerment of ethno-regional terrorist/”insurgent” groups all around the Persians’ periphery. The end goal of the ongoing Hybrid War on Iran is the same as it always has been, and that’s to advance the interconnected objectives of Regime Tweaking, Regime Change, and Regime Reboot (R-TCR). This phased progression of asymmetrical pressure first seeks to compel the targeted state, which in this case is Iran, into unilateral political concessions such as downscaling its physical and ideological presence in its Mideast “sphere of influence” in Lebanon, Syria, Iraq, and Yemen before ultimately withdrawing just like the 1980s USSR did its Eastern European “sphere of influence” in the late 1980s. Should that be unsuccessful, then the next step is to try and overthrow the government prior to “rebooting” its entire state structure through “constitutional reform” that “Balkanizes” it into “Identity Federalized” components that can be more “easily managed” through classic divide-and-rule means. Bearing this grand strategy in mind and the invaluable experiences that the US & its allies acquired over the past half a year through “test runs”, it should be anticipated that Iran’s adversaries are going to “twist the knife” through concerted economic (sanctions) and asymmetrical (terrorist) warfare measures in order to throw the Islamic Republic into Hybrid War chaos through the triggering of the self-sustaining cycle of escalation that was discussed earlier. Iran runs the very real risk of becoming embroiled in a serious conflict if it doesn’t regain control of the strategic dynamics at play, to which end it must take care not to overreact to provocations but should nevertheless demonstrate resolve when responding to them. Furthermore, the state must clearly explain to the people how it plans to implement its “resistance economy” and what “collective sacrifices” this entails. Concurrent with this, an information campaign must be initiated whereby the state informs the people about the geopolitical motivations and practical mechanisms for externally exploiting their domestic economic situation, taking partial responsibility for some policy failings and prevailing naiveté in making the country more vulnerable to these asymmetrical attacks. It’s impractical at this point to blame everything solely on Trump – whether wholly justified in doing so or not – because it doesn’t change anything in tangible terms for the people who are suffering or stand to suffer the most, especially after their unrealistically high hopes from 2015 were dramatically dashed by the cold slap of unipolarity. It’s possible that the state might quietly make Russian-facilitated “compromises” in Syria in an effort to alleviate the heavy pressure being put on it, but even this wouldn’t likely be enough to earn much relief. Therefore, the only sustainable solution is for Iran to unapologetically embrace the Golden Ring of Multipolar Great Powers by redirecting its strategic focus eastward in response to the multifaceted challenges facing it on the western front in the aforementioned domains of its Mideast “sphere of influence”. It’s not to say that Iran should “surrender” its hard-fought influence in these countries, but just that it needs to reconceptualize its role in Eurasia and urgently begin exploring real-sector economic opportunities in the supercontinent in order to “balance” its hitherto ideologically-driven foreign policy that has yet to yield the profits that its people need in order to withstand this latest Hybrid War siege. The context of this latest coordinated effort at regime change is vastly different than what Iran experienced in the 1980s given the changed international (New Cold War) and domestic (economic and demographic) conditions, which is why a radical policy readjustment might be necessary. It’s no longer possible to downplay the economic unrest in Iran and completely attribute it to foreign forces because the highly publicized shutdown of the Tehran bazaar attests to the very real nature of what’s happening. There’s undoubtedly an external hand involved in manipulating the structural circumstances in which regular Iranians have found themselves, but observers can’t overlook the fact that well-intentioned people are nevertheless still participating in these events in spite of that as they protest their deteriorating living standards and desperately attempt to stave off what they’ve been speculatively led to believe will be their continued worsening in the future. 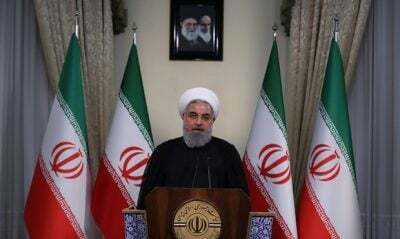 Having learned from the two “test runs” that took place at the beginning of the year in urban locales across the country and then later on in rural Iranian Kurdistan, the US and its allies have acquired a keen sense of understanding over how they could guide developments in the direction of their grand strategic interests. The danger is that massive apolitical protests by a majority of peaceful people will be hijacked by a few terrorist/”insurgent” provocateurs who try their utmost to trick the state into a militant overreaction that could inevitably lead to the loss of civilian life, after which the “Rules For Radicals” decontextualization and subsequent reframing of the situation as “unprovoked killings by the dictatorship’s security services” could fuel a self-sustaining cycle of violence. Building off of the intermittent disturbances in Iranian Kurdistan, the country’s enemies could then exploit this region as the epicenter of Hybrid War destabilization by encouraging the return of Kurdish jihadis and the MEK-facilitated arming of the “Kurdish Democratic Party of Iran” (whose leader just visited Washington). From there, it may be possible to spark other peripheral “insurgencies” that divert the attention of the security services and open the state up to an unexpected blow at either a predetermined moment or the “right opportunity”. The end goal is to overthrow the mullah-managed republic and replace it with an “Identity Federation” that makes the “New Iran” incomparably easier to control through divide-and-rule means, though this won’t happen so long as the country continues to resist the Hybrid War against it. The security services have repeatedly proven their capability in handling all manner of threats, but the government must spearhead an economic solution for sustaining its military gains and ensuring the continued “compliance” of the population. The last thing that the state needs is countless well-intentioned citizens refusing to leave the streets and inadvertently being taken advantage of as “human shields” by provocateurs, which is why something must urgently be done to placate the restless people. Seeing as how Iran’s western-directed ideologically-driven foreign policy of the past decades hasn’t yielded any real economic results, it’s sensible to at least consider whether a pragmatic geostrategic redirection eastward towards the Golden Ring is long overdue.